Get creative! Set of 5 craft stamps comes in a fun and handy tin. 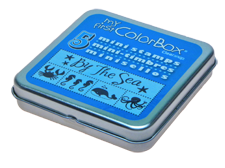 Crab, whale,octopus, sea horses and 'by the sea' message stamps. Great for young crafters! Red rubber front with foam pad. Comes with indexing labels for back of stamp.